From left to right: Nokton classic 35mm F1.4, Nokton 40mm F1.2, Macro APO-Lanthar 65mm F2. 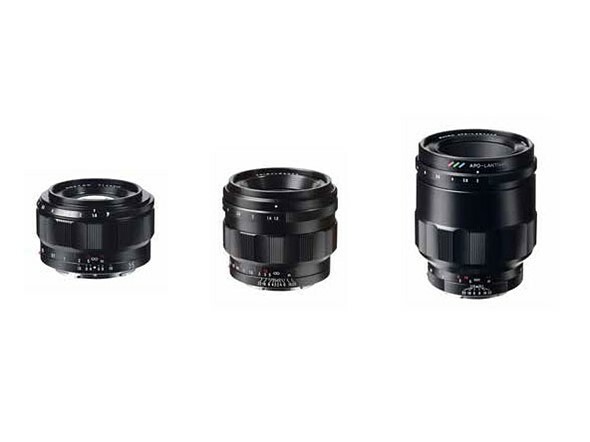 Cosina has announced the development of three manual focus Voigtländer prime lenses for Sony E-mount: the MACRO APO-LANTHAR 65mm F2 Aspherical, the Classic Nokton 35mm F1.4, and NOKTON 40mm F1.2 Aspherical. All three lenses offer complete E-mount support and will transmit EXIF data, will work with in-body image stabilization and allow automatic magnification when focusing. Originally announced at Photokina 2016, the Macro APO-Lanthar 65mm F2 is one of the brightest Macro lenses for full-frame, and offers a reproduction ratio of 1:2. The Classic Nokton 35mm F1.4 is a redesign of the M-mount version, with optimization for the Sony's sensor. Finally, the Nokton 40mm F1.2 is the fastest 40mm for full-frame format, and will be one of the fastest E-mount lenses available. Pricing and release dates for all three lenses are currently unavailable.